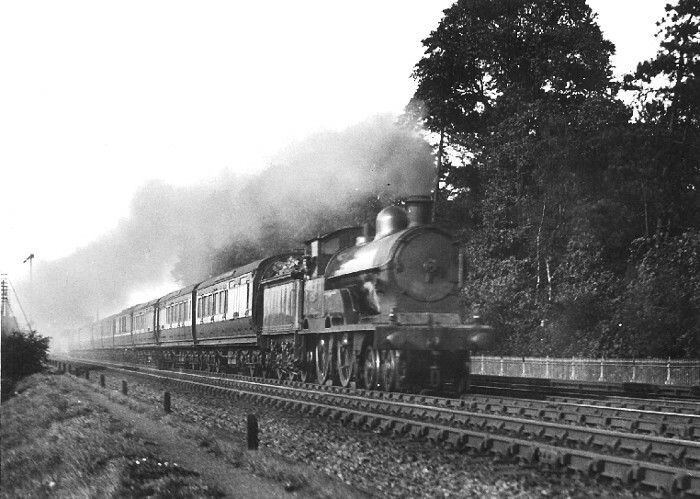 The photo shows an unidentified 'George V' Class 4-4-0 at the head of the Sunny South Express. The windshields on the sandpipes suggest a date of 1921-22. The main clue to the location is the distinctive low ornamental fencing or balustrade. The signal in the background is LNWR and the short posts in the foreground carry signal wire runs. Philip is most interested to know the location. Are those power cables running beneath the fence? If so somewhere south of Bushey is my best guess! No, not power cables (not in 1921!). Looks more like the girders of a skewed underbridge with the balustrade railings mounted on top, with a fairly wide (but perhaps shallow) defile containing a roadway, stream or similar running below the track. The photographer seems to be standing at the North end of the down-side girder - the ground seems to slope down just in front of the camera. I don't see how it can be South of Bushey - where are the DC electric lines? In any case, there appear to be only three running lines, with a goods or slow line beyond the engine. That suggests somewhere near Shilton - the only part of the main line, as fra as I know, with three running lines, the additional one being on the up side. Could the photo have been taken looking northwards from just south of Kings Langley. There is a cast iron fence on a low wall on the Up side there with the trees of the booksellers retreat behind it.